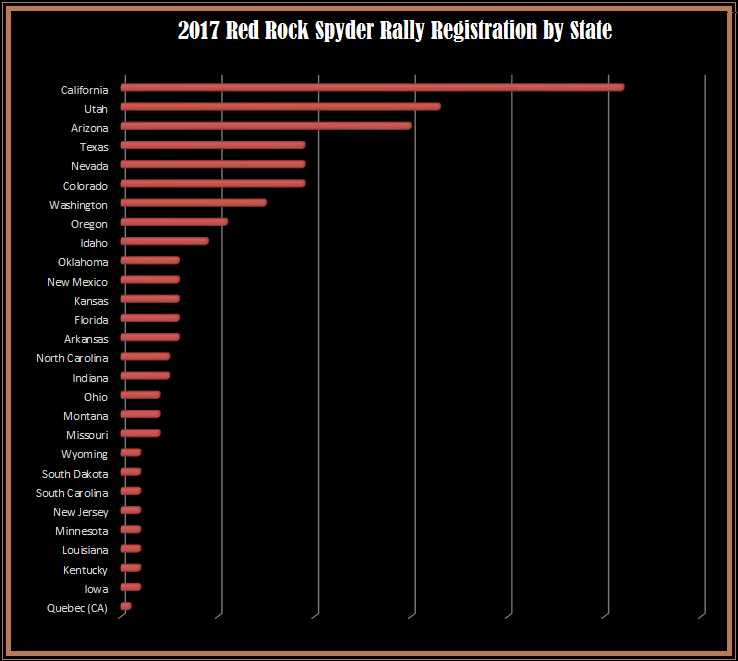 ​﻿This website contains information, photos, and news regarding the Red Rock Spyder Rally held in St George, Utah. This event will join the rotation of Western Regional Annual Can-Am Spyder events that also includes Spyders in the Redwoods and a third event announced just this year, to be held in Idaho Falls, ID in 2019. We are very excited to add these events into the rotation to give riders and enthusiasts choices of locations and events to attend from year to year. Information regarding the Red Rock Spyder Rally of Southern Utah event can be found on this page and will be updated as it becomes available. Thank you for visiting this site and showing interest in our event. We look forward to having you. It is with sorrow (and yet some excitement) that after 7+ years of service I have decided to retire from running the Western Regional Can-Am Spyder Rallies, which included Spyders in the Redwoods in California, Red Rock Spyder Rally in Utah, and what was to be the upcoming unnamed event in Idaho in 2019. When I started this endeavor, there was a limited number of rallies with our passion for the Spyder in mind. As our hobby has grown, so have the choices of Spyder-centered events for us to attend. Before I leave you, there are several other items to address. First, I'm grateful for all of you, your support and the friendships I've formed with you all over the years. Fear not, you'll not be rid of me. Secondly, the funds remaining in the account used for our rally are being donated to various charities including, but not limited to: Road Warrior Foundation, Pediatric Bain Tumor Foundation, and Make A Wish. Finally, while this is sad news for you all, know that our memories of those times are ours, and no one can take that away. See you all out on the road or at the next event to come! Thanks again to all who have supported these events over the years. Another year, another successful event!! The 7th Annual Western Regional Can-Am Spyder Rally in Southern Utah (Red Rock Spyder Rally) welcomed nearly 300 to this year's event along with over a dozen vendors. A HUGE thank you to all of the volunteers and vendors at this event, it cannot be done without you!!! If you haven't yet heard, it was announced during the farewell banquet that the event coordinator for the Western Regional Can-Am Spyder Rallies will be taking 2018 off to recharge and plan a bigger and better event in 2019!!! The Western Regional Can-Am Spyder Rallies will be expanding yet again for the 2019 rally season with another new venue and event (no name for the event yet). Motorcycling adventure clothing and riding gear manufacturer, KLIM, has offered use of their facility for the 2019 event. KLIM is located approximately 10 minutes north of Idaho Falls, ID, which will play host to the 8th Annual Western Regional Can-Am Spyder Rally in 2019. The Idaho Falls area will allow for visitors to explore the Grand Teton National Park, Jackson Hole, WY, Craters of the Moon National Park, and Yellowstone National Park. We are super excited about this new event!! In the meantime, check out the Deadwood Three Wheeler Rally in South Dakota to be held July 10th to 15th in 2018. Dates for the 2019 event are tentatively set for August 27 - 30, 2019. Host hotel(s) and event info will be posted once available. Hope you all have a safe and joyous New Year and riding season in 2018, and hope to see you all at Deadwood in 2018, and then at our 2019 event!! Spyder on!!!! ATTENDEES: For those who pre-registered online, and for those who need to register in person, please check-in or register inside the HILTON GARDEN INN BALLROOM on Tuesday, September 26th any time between 10AM and 5PM. VENDORS: Vendors will need to check in with the Event Coordinator any time on Monday, September 25th to get set-up. Vendors may start setting up anytime after 6PM on that Monday. 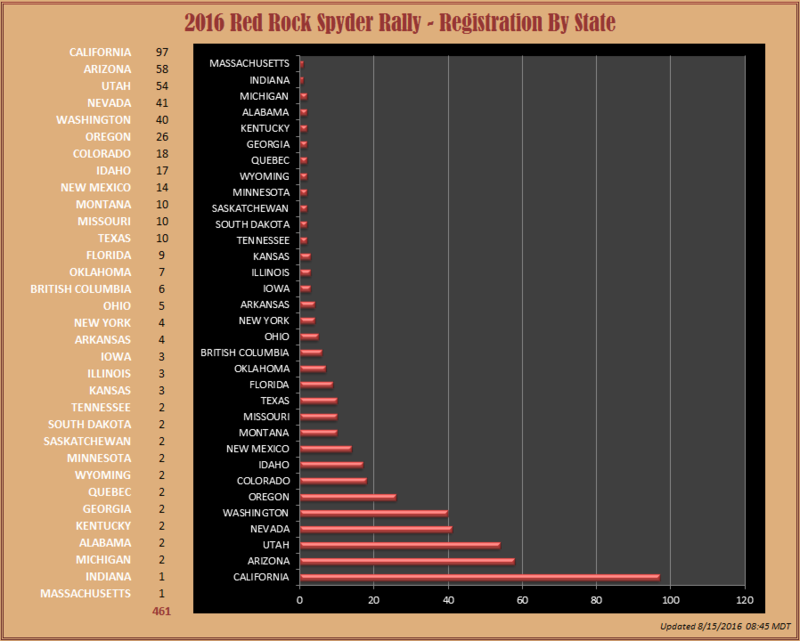 In 2016, the Red Rock Spyder Rally welcomed over 400 attendees and over a dozen vendors. The event also gave away over $7,000 in prizes to those who attended!! ​Come join us September 26 - 29, 2017 for the Seventh Annual Western Regional Can-Am Spyder Rally - the largest Spyder event in the west!! All are welcome!! Countdown to the 2017 Red Rock Spyder Rally! Host Hotel for 2017 Rally Announced! We are pleased to announce that we have reached an agreement with the host hotel for the 2017 event. Attendees may begin making reservations with the host hotels now. All room reservations must be made by phone and cannot be made online in order to receive the group rate. If you're traveling with your pet, the Fairfield Inn allows pets with an additional fee. The host hotels are both operated by Safari Hospitality and are located across the street from one another in St George, UT. Contact us if you have any issues making your reservations at the group rate. Dates for the 2017 event are Tuesday, September 26th (check-in) to Friday, September 29th (check-out). Visiting a National Park at Red Rock Spyder Rally? If you plan to visit one or more of the National Parks in the area during your visit to the beautiful State of Utah, don't forget to order your National Park Pass. Fees to enter any of the area National Park sites are up to as much as $30 per vehicle (i.e. Zion, Bryce, Grand Canyon). Save by buying this pass online prior to your visit and make your experience a smooth and memorable one! Military and seniors receive discounts on these annual passes. Rider-organized events such as this one, rely on the support from those in the community to help put the event together. Donations mean a lot to an event like this, whether it's through registration fees collected, vendor fees collected, raffle prize donations, or monetary donations, we just simply couldn't go on year after year without this. For all vendors and donors we offer FREE advertising on our website (see bottom of this page), on our Facebook page, and in the event program that is handed out to every attendee. That's a lot of exposure!! We are currently averaging over 1,000 hits per week on our website. Thank you to all who have supported us this year and in the past. We hope for your continued support to keep this event going for years to come!! Please contact us at redrockspyderrally@gmail.com for other ways you can donate and help keep this event going. A small donation such as a gift certificate, other raffle item, or even a small monetary donation, can mean a lot to the future of these events. Nothing is ever too small! As always, a treasury report for this event is available upon request via e-mail and is usually available by mid-December. Report for the 2016 event is currently available by request. 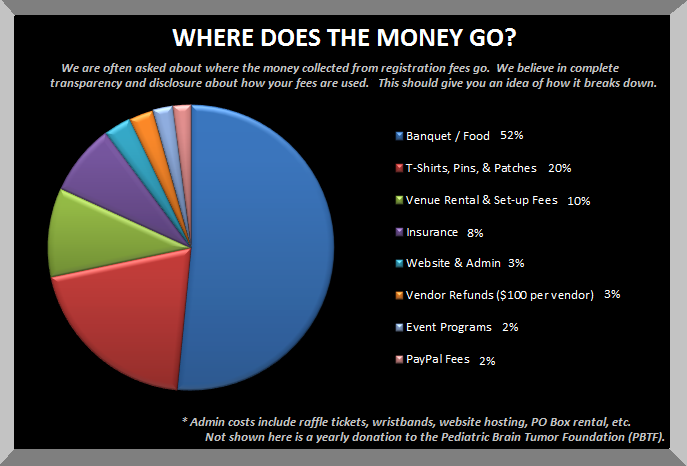 To get an idea of where the fees and donations go, click HERE. Support this annual event - have your business advertised here! Spyders in the Redwoods and Red Rock Spyder Rally have been chartered and sanctioned with the American Motorcyclists Association (AMA) since 2011. The names 'Red Rock Spyder Rally' and 'Spyders in the Redwoods', including the abbreviations 'SITR' and 'RRSR', as well as logos, website, and design herein are the intellectual property of the owner and creator of such and is trademarked against infringement or copyright. Misuse of this property is prohibited without the written consent of the property owner. Spyders in the Redwoods and the Red Rock Spyder Rally is a registered non-profit in the State of Utah. Can-Am Spyder Annual Western Regional Rallies, RRSR, and SITR specific images, banners, and logos are the property of Spyders in the Redwoods and the Red Rock Spyder Rally and are not to be used or published for any other purpose beyond the representation of the Western Regional Can-Am Spyder Rally, promotion of any such event, etc., by authorized individuals. 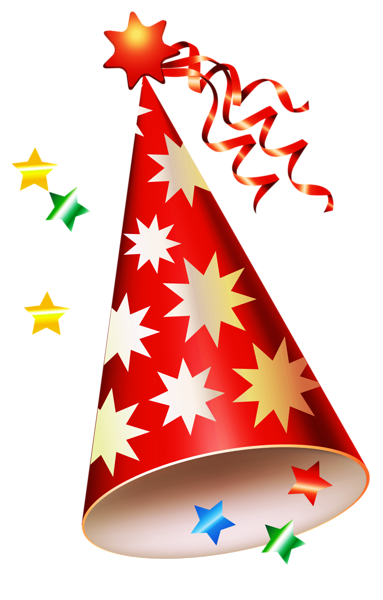 Users must obtain permission from the owner in order to use images, logos, or banners found on this website that are specific to the event(s) themselves. The Can-Am Spyder Western Regional Rallies (RRSR and SITR) are independently operated by Can-Am Spyder owners and volunteers, and are not BRP or Can-Am Spyder operated events. Events are operated only with the support of BRP/Can-Am Spyder as stated within the website. Can-Am Spyder is a trademark of Bombardier Recreational Products ("BRP"). Spyders in the Redwoods (established 2010), Red Rock Spyder Rally of Southern Utah (established 2015), and Western Regional Can-Am Spyder Rally (established 2015).